I cut this recipe from the paper recently. It's a hearty meal, perfect for cold winter nights. I fixed it the night we had the big snow, and while texting back and forth with a neighbor she requested I share the recipe. So here it is. I served it with a tossed salad on the side. That looks amazing! Anything with sour cream and cheese is a-okay in my book! I could handle that, I bet it really made the house smell wonderful as well! These look so good! 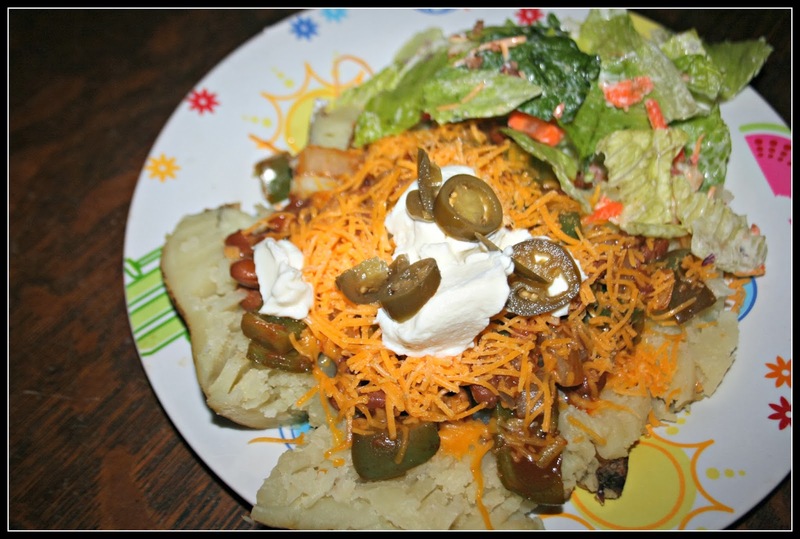 I love chili or any kind of beans with baked potatoes. I love spice! This looks great! My boys sort of panic over spicy food though. This does look amazing….perfect when we need comfort food. I LOVE baked potatoes. This looks really good! !